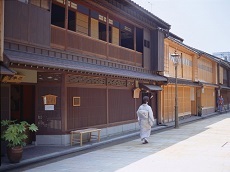 Ohmicho Ichiba, also known to some as Kanazawa's Kitchen, is city's largest fresh food market. The market is composed of several streets lined with approximately 200 covered stores selling all kinds of fresh local goods. 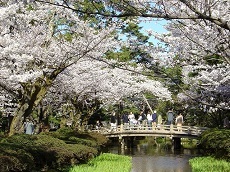 Most stores sell fresh produce and seafood but all kinds of other goods such as flowers and clothing can also be found here. 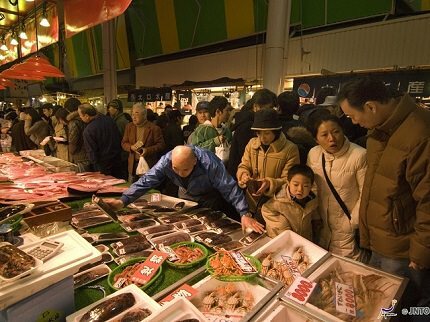 The market is most famous for its fresh seafood selection, for which many people form lines to get a taste of. Customers can create their own kaisendon, or seafood bowl, by selecting from the freshest seafood the market has to offer. The market is most popular and crowded during the early mornings due to the nature of the businesses, and you may want to get here earlier than later to make sure you make it into the restaurants before they close. You should expect lines for some of the popular restaurants as well. 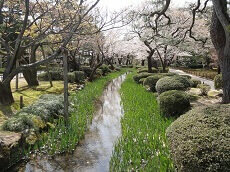 Along the streets, you'll also find sake breweries, as Kanazawa is known for their delicious sake and well-known breweries. 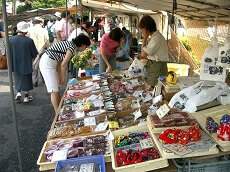 You can devour a delicious kaisendon, enjoy some delicious sake, and get your shopping done all at Ohmicho Ichiba.